Think of GraphicsGuys as your vehicle wrap marketing partner who will help you brand your brand. When you need a wrap, we are likely to ask you how it will be used BEFORE we ask the basics about size or design or vehicle. That’s because we put on our marketing hats for you every time. We are huge proponents of the best advertising tool out there, the vehicle wrap! We love to show our customers what else can be done for their project too: Floors, windows and walls, decals and banners, produced on a variety of different use substrates. All great options for a comprehensive branding effort. See our Gallery to learn morel. Whether you are looking for single vehicle wrap, or your whole fleet branded, we’re here to help. 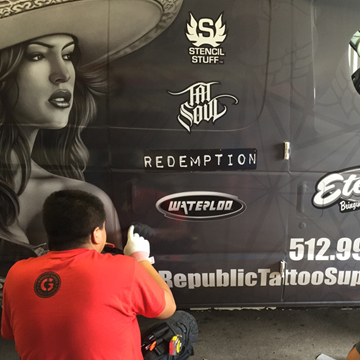 From design to final installation, GraphicsGuys offers great service and the best vehicle wrap prices in Austin.